Sure can cram a lot of stuff in there. I use one of mine as a range bag. That's not a 15.4" MacBook is it? Did you actually transport it like this or is this just for display? I'm not sure its size (it was given to me), but if I measure the white case diagonally corner to corner it looks to be 15.4", the screen itself is 11.25" straight across. Does that tell you? And yes, I did transport it in the top case. Fits like it was made to measure. In addition to the Bailout Bag I had an empty nylon grocery bag and some leather gloves I left under it for extra padding, and my scooter cover in its nylon bag on top of it. So it was not going to bounce around at all. I really didn't need to use the extra padding but it is always in my top case anyways. And better to err on the side of caution I figure. (BTW, how the heck do you guys work on a laptop??? I've never had one before and it is a lot to get used to. There is no way I could be productive on this. Need my big desktop monitor and keyboard. A few years after I graduated, my art school switched from labs full of desktop computers to requiring students to buy and use laptops. Not that they asked me (I was only the school's senior computer tech at the time ), but I thought it was a horrible move, since it meant the students would be working on 15-17" screens instead of 20"ers (which still aren't big enough at times). If I had to use a laptop instead of a desktop, I'd hook it to a full-size screen and keyboard with a real mouse whenever I could. I have a 26" external monitor I use at home. (At this point, I find it hard to work on less than 2 screens.) It's a POS and useless for color correction/proofing but is good enough to use to do layouts, photo compositing and so on. So on the road and off my desk, the MacBook is basically used for email and web browsing. I'm really considering eventually going to a MacBook Air/26" iMac combo. I think I'll actually save money in the long run this way. Maybe I'm deluded. A desktop without dual screens is handicapped, IMHO. If I were starting over with nothing, and had the money to spend, I'd go with a MacBook Air plus a Mac Mini equipped with the two tallest LCDs I could find. (Drawing portrait-format art on a widescreen display � even two of them � is frustrating.) Or I'd get a ModBook instead of the Air, for on-the-road drawing purposes. But I don't because I bought too many bags. Got a Dakine backpack because messenger bags were killing my back and shoulder. Oof. It's weird how you can get used to a laptop screen if that's all you use. My main system for the last year has been a 13.3" laptop (1366x768) with a trackpad and it seems glorious (even though I'd been on dual 24" for the last few years). I gave away my spare monitors except for an old 17" 1024x768 one and it seems so decadent when I'm home and using it now... hah! Back on topic for a moment, my tactical bag arrived today (wanted something to fit all my tools, small spares, and emergency bits for a half year trip). The first thing that really surprised me is how HEAVY the bag is. I think it's almost as heavy as some of my big backpacks. This bodes well for durability but I wouldn't want to heft it around all day. I have a hunch I am going to find myself at some point fully convinced that I left something on the side of the road because I forget which pocket I put it back into though... jeez. messenger bags were killing my back and shoulder. Oof. I'm jealous. Not that you have a 13" screen that displays 1366x768. That you can read 1366x768. I'd need +3 cheaters to see that anymore! The JUMBO bail out bag is now on sale for $30! I might get this for a guy-per bag, I hate taking the wife's flowery bag around whenever I've got the kids. Jeez, thanks, Eric. Just what I need, another bailout bag. Tan and OD are back-ordered, thank God, so at least I can wait a while! Hello all, so would carhartt coveralls fit in this bag? When it is cooler weather in the morn I will sometimes wear them under my jacket but then must take them off at work and usually don't need them for the ride home. . . I miss my SX softcase bag that I had on my Stella. I put it on the buddy, but it looked way too big. And, I wasn't sure that it wouldn't go flying off of there. . . so this bag seems like a good solution. I'm just worried that it wouldn't hold my rain gear and carhartts at the same time. . . The standard canvas/denim ones should fit. Well, I broke down and ordered the Large Economy Size Tactical Bailout Bag, and i've been using it for a range bag. The only problem is, there are so damn many pockets that most of the time I have no idea where anything is. I may have to take a marker and label every pocket! eric you see how you have it slung around you like that? does it feel like a backpack of sorts? can year wear it further behind you? like all the way around to the center of your back, i mean? does it ever bother? I can't stand backpacks myself - I wear my TBOB slung crosswise like Eric, with the strap long enough for the bag to sit centered on the seat behind me. Almost all of the weight is off my shoulder for the bag to sit securely. It's never slipped while cornering. Feel da rhythm! Feel da rhyme! Get on up! It's Buddy Time! Mine sits on the seat behind me, with the strap acting as a safety device to hold it in place and catch it when it slips. When that happens (not often), I just yank on the strap across my chest to pull it back into place. Much more comfortable than a backpack would be: no strain on the shoulders, my back can breathe, more freedom of movement. It's usually slung farther back, but it's good because I can access water bottle, cameras, etc. easily. I keep it fairly loose so I can get to it. I wear a backpack when riding the Stella to work. Hauling the laptop and many pounds of stuff I carry on my commute in a messenger bag was giving me back pains. The riding position is more hunched over. 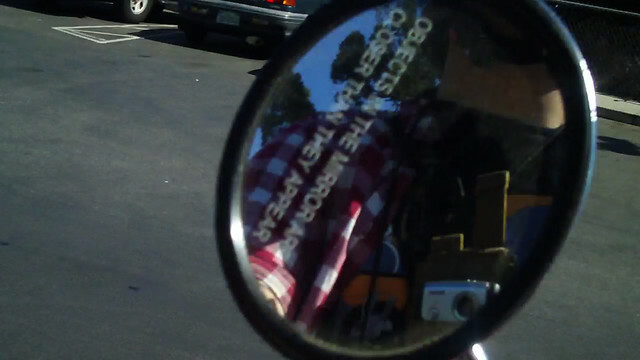 Of course the one time recently I brought a messenger bag on the Stella (didn't have time to transfer my stuff in the morning), I leaned over to switch the fuel tap while riding, the bag swung to my side, my foot was over the rear brake, I stomped the brake, I dropped the scoot. Yes it will! And if there's nothing hard in it, it can stuff into the pet carrier, too. Sadly, the OD Green bag I ordered back on Dec 5, 2011 will not arrive anytime soon, it seems. Your order contains merchandise that is temporarily on backorder. Due to unforeseen delays from the manufacturer, the backorder timeframe has been extended again. Please be assured that this merchandise will arrive back in stock. I have one small bag (Green) and two large (tan). Waiting to complete my collection! And if there's nothing hard in it, it can stuff into the pet carrier, too. Almost as if it were custom made for it.